Brittlebush (Encelia farinosa) is a medium-sized rounded shrub. It has long, oval, silver-gray leaves that are somewhat fuzzy. The branches are brittle and woody, and contain a fragrant resin. In the late winter and early spring small yellow flowers form on long stalks well above the leafy stems. Brittlebush are frost sensitive, therefore it is found in areas protected from the cold. Rocky hillsides, dry slopes and washes. Brittlebush is found throughout the Sonoran Desert and in the warmer areas of the Mojave Desert. It also can be found growing in the coastal chaparral and interior valleys of southern California. Brittlebush life span is estimated to be less than 20 years. Brittlebush plants grow 2-5 feet high. Brittlebush is a member of the sunflower family. The hairs on the brittlebush plant serve several purposes. 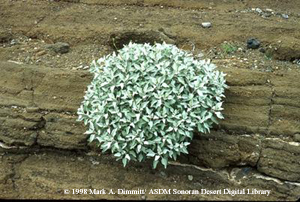 Many desert plants have hairy leaves or stems. The hairs act like a blanket over the leaves to protect them from the heat and cold. The white color reflects the sunlight helping to keep the plant cool. They also help trap any moisture and reduce the amount of water lost.